Merry Christmas, my dear friend! I hope you had a lovely and very festive holiday. As well as eating too much turkey and stuffing with family and enjoying some time off from work, my holiday season was made extra festive by the arrival of three envelopes, two of which had 46 Doughty Street as the return address. Is it weird to get so excited about the address of a house where an author who’s been dead for over a century lived once? Probably. I don’t care. I was excited. Look at all these pre-Christmas goodies!! 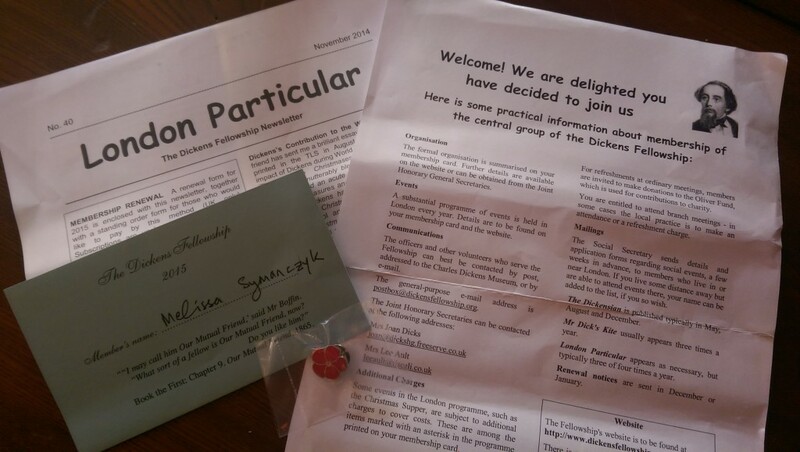 The envelope also contained a copy of the latest newsletter, the “London Particular” and a lovely little geranium flower pin, which has already been mistaken once for a very tiny Remembrance Day poppy. I was annoyed, but in retrospect I can use any further enquiries into why I’m wearing a poppy when it’s not November to put on my Dickens proselytization (is that a word?) hat and give the unwary questioner a wide-eyed explanation of why you’re so amazing and why they should become a member of Charlie’s Army. I’ll let you know how many new recruits I can muster (or how quickly the pin gets stolen as a result). 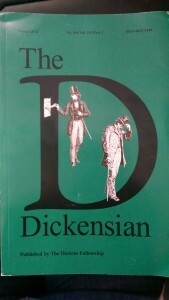 The second envelope, which arrived just before Christmas, was a copy of “The Dickensian,” the Fellowship’s journal, published three times a year. 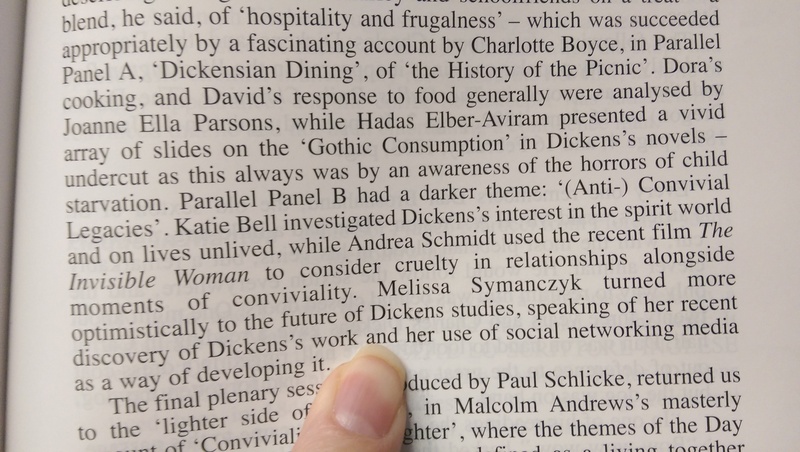 And here’s where I admit that I had kind of an ulterior movie for joining the fellowship when I did: I discovered at the Dickens Day conference in the fall that the journal contains summaries of Dickens-related conferences. Since I am a sucker for seeing my name in print, it behooved me to join in time to receive this issue. 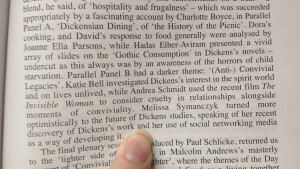 But personal vanity aside, the journal itself is fantastic – full of a broad range of articles, book and television reviews, conference reports, the doings of the many “branch lines” and other news. I also found out that as of January 2015, “The Dickensian” celebrates 110 years of unbroken publication devoted to a single author. That’s pretty damn impressive, and I’m so happy to be a small part of that tradition now. The third envelope was from my aunt in Victoria, who sent me a reprinted newspaper article that fist appeared in the Victoria Daily Times on May 28, 1938. The timing could not have been more serendipitous. 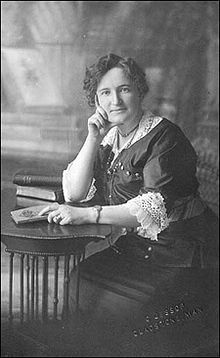 It was written by one Nellie McClung, who’s rather famous in these parts as a Canadian feminist, suffragist, author, a member of the “Famous Five” (the Canadian ones, not the Enid Blyton ones) and Liberal member of the Legislative Assembly of Alberta from 1921 to 1926 (she was also all into eugenics and forced sterilization, which is decidedly not awesome). 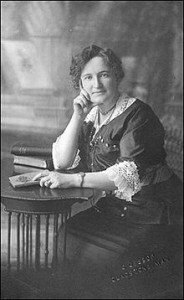 Nellie McClung. Mostly a very cool woman. I joined the Dickens Fellowship recently, and paid the modest fee they required of their members, feeling all the time that I should pay arrears, for I have been one of the mystic circle for many years. I admit, Charlie, that I didn’t have to endure such a frosty initiation, but I’d like to think that I, too, am merely making official my membership in the ‘mystic circle’ that I joined the first time I started reading your books. Merry Christmas, my friend, and here’s to more adventures in 2015!